Automatic and overturnable or tipping B.E.S.Spiral mixers solve the usual problem of having to manually remove the dough from the mixing bowl. This device lifts the mixer and dumps the dough into a dough trough or onto a table. This results in the saving of time to unload the mixer, and reduces the possiblity of employees straining their back! B.E.S. 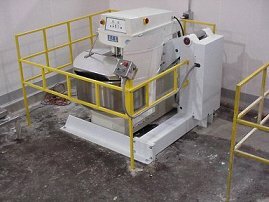 can supply you with a mixer with a lift at the time of purchase or add a lift to your exisiting B.E.S. spiral mixer. 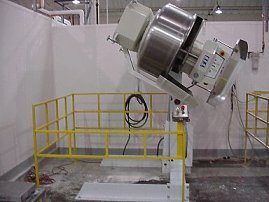 The lifting system can be hydraulic or screw lift depending upon the requested tipping height. financing to customers of Bakery Equipment Service for over 6 years.